Officials say a firefighter was hospitalized after falling through the floor while battling an apartment fire. Four other residents also had to be taken to the hospital. It happened at the Polo Club Apartments at 414 Ashley Creek Ct. off Hambrick Road. According to Capt. 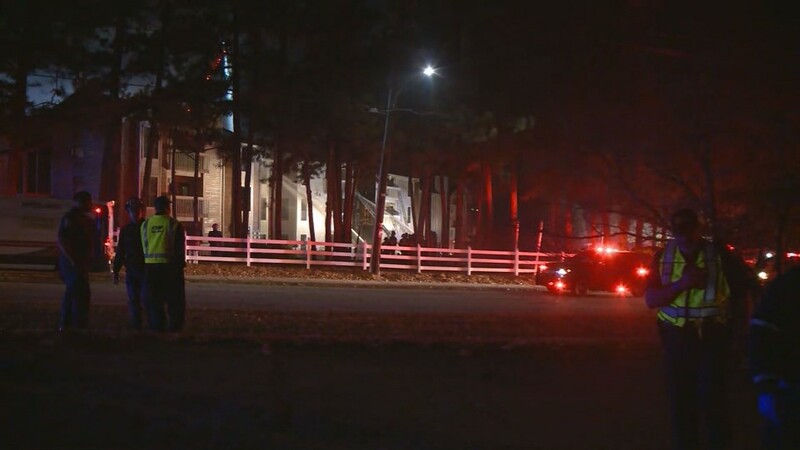 Dion Bentley with the DeKalb County Fire Department, fire crews responded to the call around 8 p.m. after getting reports of the fire with a possible entrapment. When firefighters got to the scene, the breezeways of several units were already consumed by heavy smoke and 30-foot flames, cutting off exits for families trying to get out. Bentley said one person was forced to jump from the second floor of one of the units in order to escape. Shannon Fikes said she had just gotten home after working a 10-hour shift and was sleeping when she woke up to the scary scene. “I had laid down and I heard a lot of commotion, and I went to open the door and all I saw was flames,” Fikes said. In an instant, Fikes said she knew she had no choice but to close the door, run to the patio balcony and jump from the burning building into the bushes below in her bare feet. “I just thank God my daughter wasn’t there,” Fikes added, noting that it would have been difficult for the teen to escape because she was on crutches from a previous injury. But she said she and her daughter Makayla lost everything – and doesn’t have renter’s insurance. “I just thank God that we have our life. That’s more important than material things,” Fikes said. Bentley said once fire crews got there, they immediately worked to confirm all 18 units were empty of residents before they started working to contain the flames. It was during those moments when one of the firefighters fell through the floor of one of the units, triggering a “mayday” call. Crews were able to get to the injured firefighter in less than a minute. Four other tenants had to be transported to the hospital for minor injuries, like smoke inhalation. At least 30 people were displaced as a result of the fire, which burned through 19 units. The Red Cross is responding to offer help to those displaced. 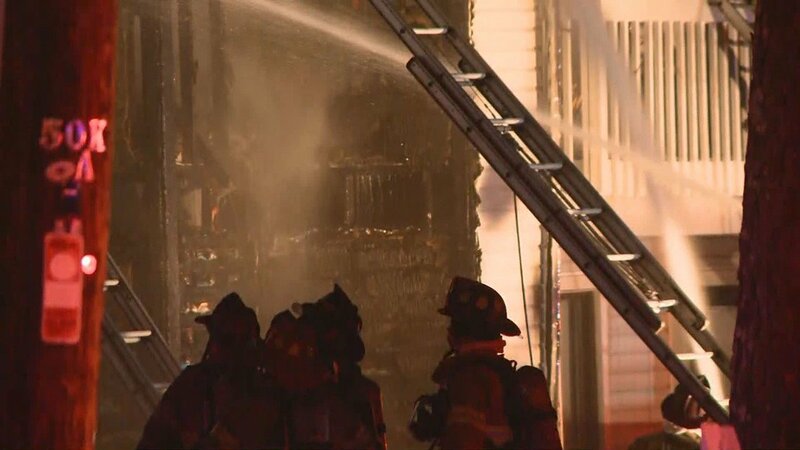 The official cause of the fire is still under investigation, though some residents told 11Alive that they believe a generator being used at one of the units was the source of the fire. DeKalb Fire Department posted pictures from when the building was fully engulfed in flames on their Facebook page. The pictures show how large and destructive the fire was at it’s peak.